Fractals are basically images created by following a complicated mathematical formula, and applying the results of the formula to color. 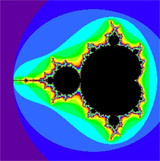 Traditional fractals such as the Mandelbrot Fractal on the right display fairly rudimentary geometry, however fractal variants referred to as flame fractals have striking artistic qualities. 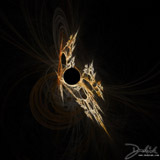 A few of the flame fractals that I've created are displayed below. I liked the 'splash' fractal so much, that i wrote a script to animate it, and then placed the video to music. This animated fractal video can be seen on the video page. If you like this gallery, or have any comments/questions/suggestions, please feel free to contact me - I'd be happy to hear from you.